Hi Everyone! Just wanted to drop in with a quick note that I reopened my etsy shop a couple days ago :) This weekend is my last couple days to get ready as I am selling at UCI all next week! Do you have any exciting/fun/interesting plans? Thanks to all the lovely guest bloggers that were here this week: Amanda, Xenia, Barb, Julia, and Nora! I'll be back to regular posting next week! xo. I'm loving the stuff in your shop. Perfect for friend Christmas gifts. And one for myself of course! Happy Friday to you too! I use that line every week. We have company nearly every single Friday night for martinis & homemade pizza. As people come in the door, I say Happy Friday with gusto! 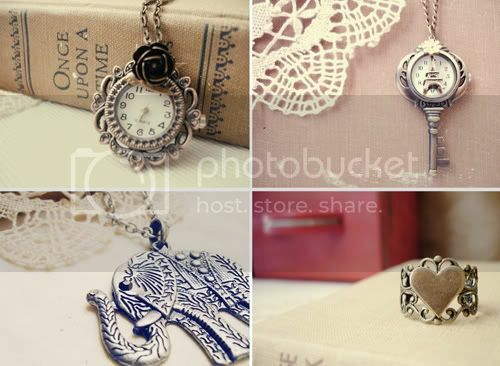 How gorgeous is that elephant necklace! So excited that you've reopened your etsy shop!! :) so many cute new goodies!! welcome back!! your shop looks as gorgeous as always. Gorgeous treasures in your shop! what lovely pretties you;ve got in your shop. i love love love that elephant necklace! a couple months ago i went to thailand for my honeymoon, where we stayed at an elephant ranch taking care of elderly elephants! so glad your shop is back open sweetie!!! :) have fun at UCI again! wish i could come visit again!!! december can't come soon enough!! i was waiting and waiting for your shop to open!! i snagged me a lovely pocket watch necklace.. yay! Nice to see your creations on back on sale - I think everyone missed you during all the wedding fun! That's my alma matter. Graduated 1996! Hope it was a good week.